Want to kow how to rig weedless soft plastics and catch more fish? Read this article! SWIMMING weedless-rigged soft plastics would comfortably rate as one of my most successful and preferred forms of luring. From our rivers, dams, tight water creeks, and even the big blue water playground, soft plastics rigged in this fashion bring about a mixture of serious stealth and an ability to go where other lures simply cannot. Rigging a soft plastic is a simple task but it must be done with accuracy and precision so that your final product is one that looks incredibly realistic and, more importantly, swims correctly. A plastic rigged bent, kinked, or a hook point positioned incorrectly will leave you with a “warped” looking presentation that’s certain to swim like a true lemon. It really does pay to have a more in-depth look at the various methods of rigging weedless presentations. Rigging a soft plastic must be done with accuracy and precision so that your final product looks realistic and swims correctly. Hooks, like all fishing tackle, come purposely built, which means they have a specific use and intended purpose. True “weedless” hook patterns come rigged with a brush guard to help the hook from fouling in areas of vegetation. While these aren't a 100 per cent effective, they're much better than usual if fishing areas where weed growth is prevalent. Worm style hooks are what the vast majority of anglers (myself included) are using these days for 90 per cent of weedless soft bait rigging. There are many hook patterns and brands such as Owner, TT, Mustad, VMC, Gamakatsu and Wilson, who are all now producing high quality worm style hooks. These hooks come as straight shank, true turns and extra wide gape patterns, and can be purchased as both weighted or weight free hooks. In certain instances the lead weight can be an attached or fixed lead head (in various weights), or can come as a fixed weight on the actual keel of the hook itself. Both work very well and the best idea always is to carefully match hook size and pattern to the various plastic being used. There are also variations to adding weight to your chosen hook. For instance, where a bullet head type sinker is allowed to run along your leader down to your plastic (texas style rigging); or a ball sinker which sits on the inside of your actual “loop knot” to your hook/plastic; and lastly, where you crimp weight (such as a split shot sinker) onto your hook yourself. All are effective but it must be mentioned that the “ball in loop knot” method is absolutely useless if using a worm style hook that features an eye sitting at 90 degrees. The sinker will fall to one side rendering the plastics action useless and this method must be used with hooks with an eye that sits at 180 degrees. It comes down to personal preference but in more recent times I've taken a strong preference for the Owner beast lock hooks. The unweighted version of these hooks give you the ability to simply “crimp” on the desired weight and position it on your hook to sit directly under the “chin” of your soft plastic. What this gives is one incredibly realistic swimming action, keeping the head slightly down and tail beating strongly. With an understanding about hooks, weights, sizes and patterns the job at hand now is to actually “rig” your chosen soft plastic. This is a simple procedure but does need some explanation for those who may be unfamiliar with this deadly method. It begins by simply inserting your hook point into the head of your soft plastic and back out through the “chin” area. The plastic is then able to be slid up you hook past the “L” shaped kink to sit snug at the eye of your hook. Your plastic now needs to be rotated 180 degrees and once done you need to carefully align your hook up with the chosen bait to determine where the hook will rest. Once established (or even marked out) you are able to insert the hook point through the body (underside) with the hook point coming out on the “back” of your chosen plastic. This will sit very flush or if desired your hook point can be lightly pinned just under the skin of the lure. The variation to this method occurs when certain hooks such as the Owner Beast and VMC hooks feature a “twist lock” keeper in the eye of the hook. This allows for the plastic to simply be screwed into position via the twist lock keeper making life even easier. Your final presentation will be one that is ready to be cast in and around structure and if necessary rolled through heavy vegetation. Let's look at our popular species and the reasons why weedless-rigged plastics work so well. Barramundi are a prime candidate for a weedless presentation. In a field that was once dominated by casting and trolling hard bodied lures, soft plastics have now stamped their authority when it comes to targeting these structure orientated brawlers. Plastics rigged weedless are cast amongst timber snags, rock bars and rolled amongst weed and lillie beds is a method. There are of course numerous reasons behind this and the first lies in the fact that some of the profiles, colours and shapes of soft plastics are such a near replication of the baitfish these fish are feeding upon it is quite remarkable. Secondly we are able to cast and swim these out from the structure these fish are holding up in and we can do so without the fear of a snag or foul up. For the more novice lure casters amongst us, these have been an absolute saviour when casting amongst mangroves and tree lined stretches as it saves much time recovering lures from wayward casts amongst trees. Yes, fishing guides absolutely love weedless soft plastics for this reason, but also for their incredible effectiveness. Paddle tailed fish profiles reign supreme for these two species and a paddle tailed plastic rigged weedless and slowly rolled out of timber snags or along rock bars is one devastatingly effective technique. Retrievals need be nothing more than a slow to medium paced roll which simply imitates a fish swimming past a snag or along a rock bar. It sounds like a very simple technique but it's also one that looks incredibly natural and realistic and gives a barramundi or jack holding on the structure the quick opportunity to pounce on a passing meal. 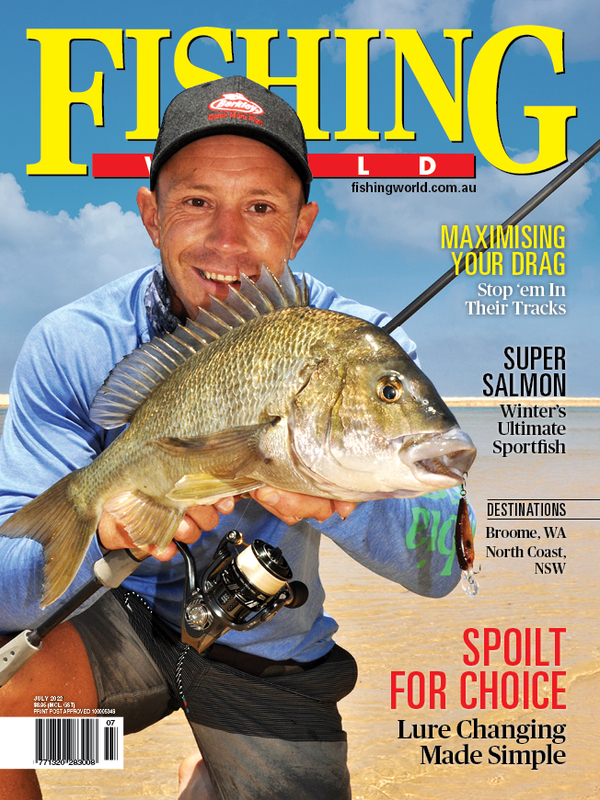 Bream and bass comfortably retain their positioning at near the top of the table when discussing the popularity of weedless plastic techniques. We now down size the offerings (from that of barramundi & jacks) and start looking at much smaller plastics and smaller worm style hooks to match. A technique that has worked phenomenally well on Australian bass is to work a 3-inch plastic rigged on a size 2 worm style hook. With this I simply incorporate a 1/16th bullet head sinker and allow this to run down my leader to meet the lure (Texas style rigging method). This set up is cast against the edges of weed and lillie-lined edges or timber structure/snags and slowly worked out using a twitch like retrieve. A couple of short sharp twitches and a subsequent pause phase imitates a grub or smaller fish incredibly well and once again these can be cast right in the thick of snags or amongst vegetation. Similar techniques can be used for bream and along oyster racks, mangrove lined edges and man-made structures such as our jetties and bridge pylons. Smaller plastics from say one to 3-inch rigged weedless are every bit as deadly and we have the luxury of many differing bait fish, crab and prawn patterns to choose from. A serious amount of stealth can be utilised here too as plastics may be fished totally weight free or with the aid of a tiny split shot sinker to suit the conditions of the day. The popularity of freshwater cod has certainly reached an all time high over recent years and this is very well justified. They're a fantastic looking fish and their willingness to crash a surface lure, swimbait and other lures is also a huge contributor towards this surge in popularity. Given the environment these fish live and their absolute love of heavy timber snags, weedless soft plastics can be a fantastic inclusion into any luring kit. I've had many lure casting sessions myself whereby I have thrown surface lures non stop for zero hits only to turn around and cast a weedless fish profile soft plastic along the same snags, and bang, a fish first cast. What this displays is that there are times where the fish are “lazier” but will certainly take the opportunity to eat when the offering comes past home and up in their face. Sure, you do miss out on that surface explosion but the hit on a slowly rolled plastic is also a real buzz and it can be the difference between heading home empty handed. Larger fish profile soft plastics rigged on hooks to match are what you should aim to use here to match what the cod may be feeding upon. Bigger fish such as spangled perch and even baby bass are all high on the menu. Surface frogging is a visual way of catching mangrove Jack and other species. Another soft plastic technique that deserves its own special mention is “surface frogging”. What this refers to (as the name applies),is surface soft plastics that replicate a “frog”. These are specifically designed to imitate a frog swimming and hopping between lillie beds and in any freshwater scenario where barramundi, bass and cod are your targets you would be labelled a genuine madman if you didn't carry a few in your luring kit. The action of many through the water is incredibly life like and the hits can be nothing short of spectacular. Rigging smaller and even larger plastic frogs does need some consideration as you desire is to keep the frog on the surface. Incorporating heavy hooks or ones with lead weights will obviously see your presentation sink. This is not where you wish to be. Surface frogging brings about the adrenaline fuelled visual excitement we all thrive upon and some of the hits from fish such a barramundi, cod and mangrove jack can be so seriously explosive it will keep you coming back time and time again. Gear selection can come down to personal preference. There are the anglers who love the ease and versatility of spinning set-up and there are those who love the accuracy of bait casting rigs. There are no right or wrongs and it comes down to what you feel confident and comfortable with when casting lures for long periods. I use a combination of both depending on what species I'm targeting. In the hunt for barramundi, mangrove jack and cod I much prefer the accuracy and ease of operation offered by bait casting set ups. If boat or kayak based these outfits are a dream to cast and enable you to really punch up lures against timber snags and vegetation. If targeting the likes of bream and bass I will choose spinning set ups in preference as these give you the option to cast much lighter plastics and smaller presentations on light line. As a rough guide only I'll generally run 30 lb braid and 40-50 lb leader when in pursuit of barramundi, mangrove jack and cod while across spinning set ups for bass and bream I will run anywhere between 3-8 lb. What you need to assess in any given scenario is the type of terrain you're fishing across and whether or not your gear may be like taking a knife to a gun fight. In certain areas 30 lb gear may not be enough to stop a barramundi in a forest of timber. Pay attention to detail and apply logic to your approach. Casting and experimentation is your key to success with weedless soft plastics and as regular success comes your way, confidence levels will always rise. Before casting anything you have rigged remember to always “swim” your chosen bait close by to simply observe the lures action. If swimming with that realistic tail beat or desired wiggle then you can be quietly confident as fish will be attached very soon.